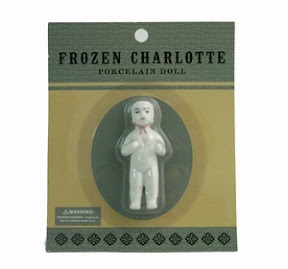 Something that has become a little bit of an obsession for me lately, is an antiquity called a "Frozen Charlotte" (sometimes referred to as a "pillar doll". 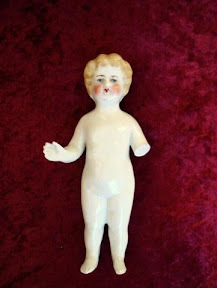 A Frozen Charlotte is a tiny, tiny porcelain, china or bisque doll made from 1850-1920, moulded all in one piece, and usually naked except for rare occasions. 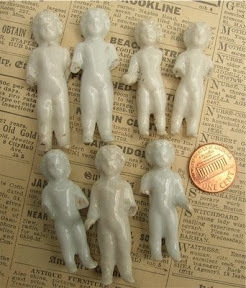 They're almost always white, sometimes a little face will be painted on, and sometimes,( very rarely), they'll be painted entirely black. 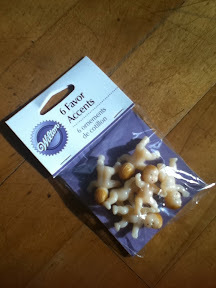 It was common to place the tiniest ones in cakes or Christmas puddings for good luck and as party favors (similar idea to King Cake babies I believe). 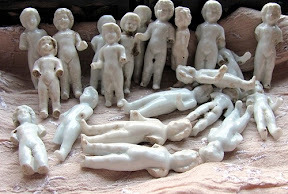 The little Frozen Charlottes get their name from an 1843 cautionary poem by Seba Smith, about a young girl who refuses to dress properly for winter out of vanity, and freezes to death as a result. Frozen Charlotte necklace by Ghostlove, I need this!